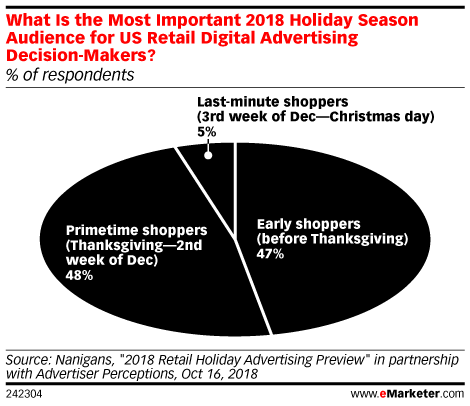 Data is from the October 2018 Nanigans "2018 Retail Holiday Advertising Preview" in partnership with Advertiser Perceptions. 100 US retail digital advertising decision-makers with the title director or above were surveyed in August 2018. Each decision-maker represents a company that generates at least $100 million in online sales annually, earns at least part of its revenues from selling products online and allocates part of its annual advertising budget to the 2018 holiday shopping season.